One of the best setups when a stock or index is recovering from a weak price is the ascending triangle pattern. An index which just had a drop but slowly rises may form an ascending triangle which is perfect for traders to long. Stocks that are experiencing a nice run up after weaknesses for many years may also form an ascending triangle that is perfect for traders to buy. The bottom line is this, when you see a stock or index form this pattern shortly after it starts a new uptrend after a downtrend, you can expect the pattern to be very reliable and have good follow through. The above diagram is what an ascending triangle looks like. The stock has been moving up and down trading sideways but as it moves along, the sideways movement becomes smaller and contracts. The price movement becomes more refined and you can actually draw a horizontal trendline at the top of the price congestion and an uptrendline that connects the low of the prices. When both of the trendlines meet, they form a nice ascending triangle which is easy to see as well as beautiful to trade. 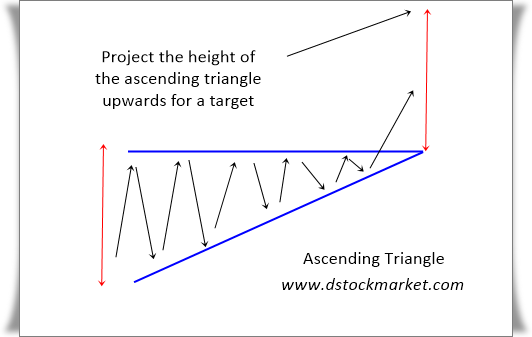 The ascending triangle is great because it often comes with a price projection or targets. This allow traders to be objective especially when there is strong overhead resistance. But most of the time, the ascending triangle pattern will overshoot its target. Traders can often sell half of their position or one third depending on how strong their conviction is and try and see if they can ride the remaining position for greater profits. The longer the time frame that the pattern appear in, the more potent the target will be. For example, a weekly ascending triangle's pattern target should be respected more than a daily ascending triangle's pattern target. The chart above shows how an ascending triangle looks like. The pattern appeared in the 60 min chart of the S&P 500 futures. It takes a bit of practice to spot the pattern. Notice how the S&P 500 futures broke out of the pattern and met its target perfectly. One of the open secrets of the stock market is that volatility is often followed by periods of quite or contraction and then the contraction is followed by volatility once again. Practitioners of bollinger bands will know this concept very very well. Since many will be using the bollinger bands to try and capture a breakout or breakdown in a stock. When the bollinger bands is contracting, it will alert the trader to try and see if the stock might break out once the bollinger bands starts to open wide. To us traders who do not use bollinger bands, we just know that a period of big volatility is soon followed by quiet and then it will become volatile again. Or in other words, range expansion is followed by range contraction and then a breakout will happen which makes the range expansion happen once more. I learned about the concept of volatility contraction from Market Wizard Mark Minervini's book Trade Like A Stock Market Wizard. Minervini will look for volatility contraction to buy the breakouts in a stock. The ascending triangle is a picture of volatility contraction. Notice as the pattern forms, the stock's average range becomes smaller and smaller till at the tip it breaks out and range expansion begins again. If the ascending triangle pattern forms in a new uptrend after the stock has bottomed, the pattern is perfect to absorb the supply on the left. Absorption of supply simply means there are a lot of people who bought the stock in the past and have lost a lot of money on the stock. These people will eventually want to sell the stock to recover their profits or capital. In the weekly chart above, you can see where the daily ascending triangle pattern formed. There were a lot of people who bought at the top of the rallies in the past. These people have lost money and the formation of a daily ascending triangle helps to absorb the selling pressure of past holders without making the stock go down. Stock go down for many reasons and one of them is people who bought at the top in the past selling to regain their capital. An ascending triangle is powerful because it absorbs those sellers without going down. Once the pattern completes, the breakout is often very nice and smooth because the sellers have all sold. So there is nobody there left to sell and push the price down. Which is why the breakout of the ascending triangle can often produce massive gains in a short period of time. There are many ways to skin a cat as they say. Although the ascending triangle pattern is universal, how we trade it and manage the trade can be very different depending on the trader. Once an ascending triangle pattern forms, the trader can buy the stock or index once it breaks above the highs of the pattern. Where do we place the stop? Traditionally, educators will teach you to place it some where below a pivot point. That is helpful but a dynamic trader can have multiple stop loss areas with different position sizing to capture the most profits with minimal risk. So instead of a single stop loss buying 50,000 shares at the conservative stop loss, the trader can have different stop losses an ending with 100,000 shares. Because when this pattern works, the rise and gains is tremendous. How about taking profits? Usually when the target pattern is met, it is good to take at least some profits off the table. How much profits you want to take will depend on your conviction of the trade and the type of resistance that is overhead. The stronger the resistance, the more profits you should take off the table. But a good way to manage the trade might be to sell 1/3 or 1/2 and monitor the position carefully. By selling some and keeping some you get the best of both worlds. You get to have some profits and if the index or stock continues to rise, you get to participate and earn more profits. Once the position give you at least 1:1 reward, we move our stop loss to breakeven and as it rises even more we use a trailing stop loss, either an MA or box support areas.